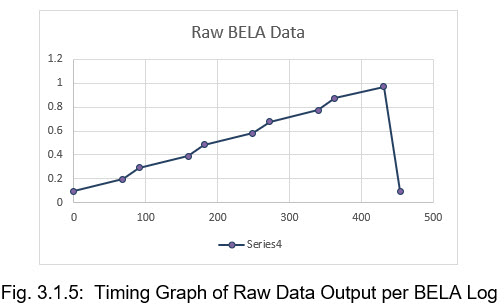 As part of our development efforts, we depend on a clear understanding of the timing issues associated with the BELA computation and functionalities. The development process calls for some of the signals and computation derivatives to be output to external files, using the libraries and functions built-in to the BELA program. Inconsistencies were discovered in the data that was registered in these files. These test procedures were designed to ascertain whether there are, in fact, anomalies in the data accumulated in these log files. The test was carried out using a BELA unit running dedicated programs to carry the tests out and an external oscilloscope that measured the realtime signals output from the BELA. The internal BELA scope (BELA-scope) and the file logging features of the BELA were also used. The test program created a repetitive series of equal steps, rising from a minimal to a maximal value. 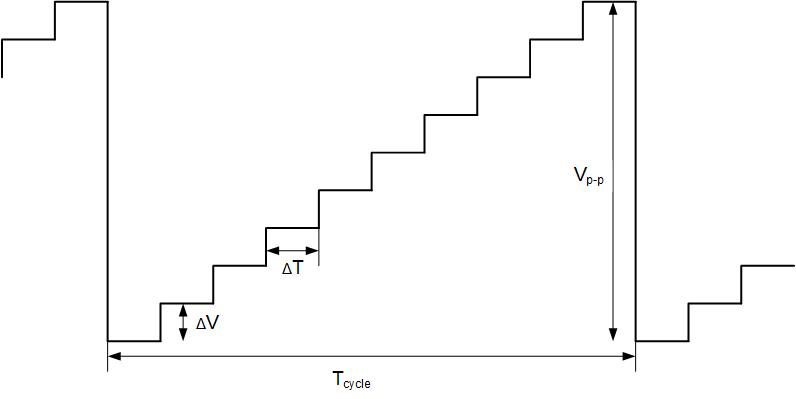 10 such steps per cycle were implemented, creating a “staircase” as shown in the attached diagrams below. Each row represents an output of a discrete level in the cyclic staircase. Other data elements are correct, as expected. 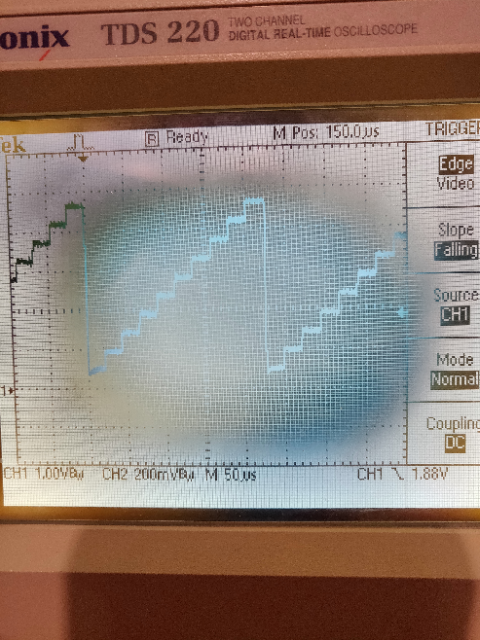 Incremental Steps Example 1 --  Example with Output to Analog channel, measured via external oscilloscope. 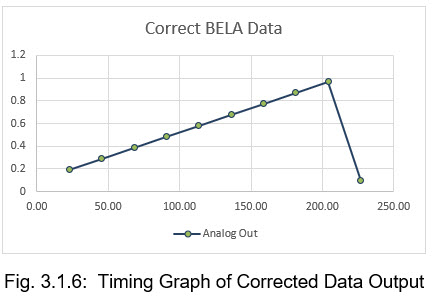 A series of 9 steps of equal height are issued from the analog output of the BELA. The output is also applied to the BELA scope, and 5 cycles are logged onto an external file. else            //  if(gCounter > INTERVAL_LENGTH*context->analogSampleRate) then Operation Scan Interval is over! which does not match your findings. Also running with 4 or 2 analog channels looks nothing like your log above. Are you sure this is the exact program you used to generate the logs above? where n is the current frame, and gCounter is increased once per frame. You should probably increase gCounter only once per block *. Your oscilloscope plots seem to indicate that the samples are indeed equally spaced over time and that the weird timestamps are only an artifact of a bug in the application code you used to generate them. Last, if you really are interested in the timing of the analog outputs for some critical application, I'd suggest you check the interval at the DAC and not in software: if you write your logging code correctly, it will always give you the namely correct results by definition. However, sub-microsecond jitter can occur in propagating the value to the actual output, and that you can only find out by checking the actual voltage at the analog output. Can you please define precisely what are the relationships and dependencies between the number of analog channels, the block size and the number of analog channels. Also, what is the relationship between audio frames and analog frames? Are they dependent on the block size selected? - 22.05kHz, in which case you have 8 analog channels(context->analogInChannels == 8), and you have half as many frames as the audio frames, e.g. : context->audioFrames == 8). - 44.1kHz, in which case you have 4 analog channels(context->analogInChannels == 4), and you have the same number frames as the audio frames, e.g. : context->audioFrames == 16). - 88.2kHz, in which case you have 2 analog channels(context->analogInChannels == 2), and you have twice as many analog frames as you have audio frames, e.g. : context->audioFrames == 32).